Stamp a Sweet Impression: Scrappin' with Key Ingredients! One of my New Years resolutions was to get back into scrapbooking. It was my first passion, and it definitely lead me to stamping, and it is also something that my family treasures. So in keeping with my resolutions I wanted to share a page I did using the Easter Key Ingredients kit and Sweet Spring. I have to say the Key Ingredients kits are fabulous for scrapbooking, because everything is so beautifully coordinated. And while the kit is sized for cards, I had no problem transferring them to my 12x12 scrapbook page, and they would work perfectly with 6x6, 8x8 or 8 1/2" x 11". I started by creating a three panel backdrop with the designer paper in the kit. It was cut to 3 1/2" x 6, and layered on a panel of Frosted Teal cardstock from the kit. I rounded the corners because I was thinking it fit with the Easter Egg theme. I cropped the photos to focus on the subject, and add a little interest with their different sizes. The eggs on the lower left were cut with long Oval Nestabilities out of the designer paper from the pack. 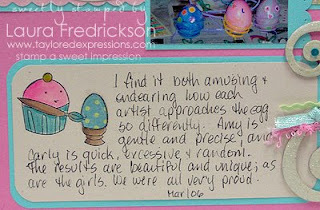 The "chocolate" egg was decorated with ribbon from the kit, and the patterned egg has some gems added from my stash. These pictures are from Easter three years ago, and just pulling them out got me reminiscing. My youngest still had her baby teeth, and I recall how reluctant I was to have her grow out of that gorgeous smile. Of course they grew in just as beautiful, but there's a mother's longing to keep her kids as, well kids. I wanted to capture them in "action" as well as posing, and the picture of the hands says it all. Small and sweet and industrious. My journalling focuses on their different approach to decorating the eggs, and it's quite a reflection on their personalities that is still true today. I stamped the cuppie painting the egg from Sweet Spring, and pieced in the egg so it would be decorated in Easter fashion. How perfect is that image? I wanted to include the bunny eared cupcake too, but I just couldn't figure how to fit it in. The flourish on the edge of the journalling is a Bazzill chipboard piece that was stamped in Vanilla and embossed with Irridescent Ice for sparkle. I wanted it neutral so I had a reason to add more of the fabulous ribbon from the kit. The title is done with stickers, and I added a row of punched eggs using scraps of designer paper. I just thought it looked so fun! I think I might try to set a goal to get at least one scrapbook page done with each kit. I love that I don't have to go searching for all the matching items, because all the ingredients are in the kit! Tomorrow is the start of the previews for Taylored Expressions new release, so make sure you have the Baker's Dozen's blogs bookmarked. You are going to love this release! Until then, have yourself a sweet day, and thanks for popping in! Fabulous layout, Laura! Your girls look like they're having so much fun! And I love those patterned paper eggs. Beautiful! What an adorable Scrapbook page Laura! Darling photos of a treasured time!! Love the eggs and that that cupcake fits your journaling so perfectly!! What a fabulous scrapbooking page. I love those colors and papers. Awesome job! Oh Laura, what a beautiful scrapbook page!! That cupcake coloring the egg is just perfect in the journaling box and I love all the egg accents. Scrapbooking was my first passion too, and I've soooo let it go once I got into card making. I need to get back *there* again. Laura, this is wonderful girl! Love the patterned eggs you created and your journaling box is awesome!! Sweet pics of the girls!! WHat an awesome page, Laura! What a gorgeous page Laura! Love all the little detail you added and the photos are set off beautifully by the patterned paper backdrop. This is great Laura. I love your journaling! Wonderful pictures to scrap too.